Open frame touch screen displays make a great addition to commercial and industrial applications. There are open frame displays found everywhere, ranging from billboards to digital signage displays. A lot of organizations try to use normal desktop monitors for visual aids, but these are difficult to integrate into a specific use case design, nor are they designed to function 24/7 like industrial open frame monitors. Being able to adapt a display to a specific kiosk design is very important. Gaming machines are often styled with a theme and need to be able to replace components instead of the entire device. ATMs are highly used around the clock and need to be able to fit a special design that is durable. Industrial usage of open frame technology makes sense because displays must be scaled into application usage and connected to typically very expensive equipment. Vending machines must use displays fitted to the brand/theme. Avionics equipment is very expensive and the appealing element of open frames is that each component can be replaced instead of having to replace an entire unit. Medical equipment is also expensive and under constant usage. Reduce costs associated with long term deprecation of research equipment. Industrial open frame displays are technically scaled down versions of desktop monitors. The major difference is the components used inside the display are rated for industrial grade usage. Additionally, these component are not dependent upon each other and can be replaced if another component fails. Because of their constant usage, it is normal for some parts to wear out and being able to switch out components reduces costs over the long run. There are loose touch screen LCD components for open frame displays . This offers the highest degree of flexibility for custom mounting or after-market packaging. In such a case, a touch screen LCD module, A/D and OSD boards along with the power supply can be positioned in a custom manner. There are industrial open frame displays that can be mounted onto a small rear metal bracket. Such open frame displays also ship with all of the necessary LCD components in an industrial LCD enclosure, a shown below. 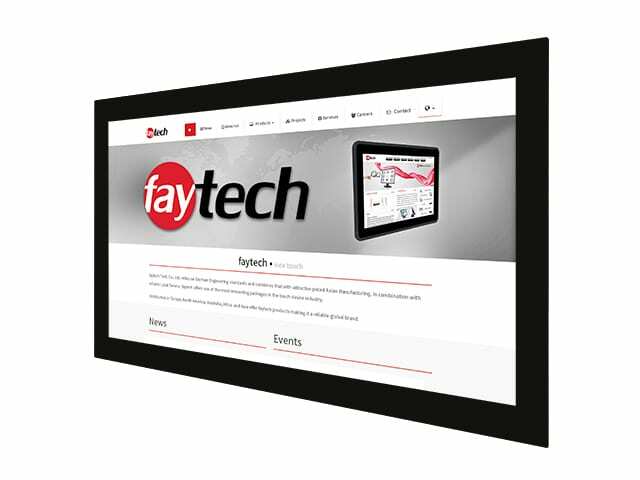 At faytech North America, we can provide your organization with stock or custom touch screen display in an open frame format. Our open frame specialists can evaluate your use case scenario and share their professional opinion with you free of cost. When it comes to open frame touch screen technology, not only is faytech North America a global leader, but a leader with a local presence. Contact us today to learn more about our touch screen technology products and services.